Find a home for everything– Brooms need a spot. Books need a shelf. Blenders need a cabinet. Everything in sight should have a spot for storage. When in doubt, buy wicker baskets to house miscellaneous items and utilize hidden areas (drawers, cabinets and ottomans) for items that don’t need to be on display. In a real hurry? Place all items that don’t have homes yet in a room you don’t use often or won’t use for the event. Close the door. Done. Sweep, wipe and dust– Now that everything is in its place and not on the floor, it’s time to sweep and/or vacuum all rooms your guests will encounter. Next, get bathrooms ready by cleaning mirrors, wiping floors and tending to the sink and toilet. Finally, shine up windows and countertops and dust the television and cabinets. Get your space guest friendly-Remove any non-essentials from rooms to leave a polished and mingle-ready zone. Store fragile items in a safe place. Straighten the coat closet for guests and have a spot for shoes, umbrellas and any gifts guests may bring. Kitchen scrub down-Prepare the kitchen for a party by assessing and cleaning out the fridge- you’re going to need room for all the delicious food you’ll be preparing. Clean the cooktop and other surfaces so that guests can see it sparkle and organize the pantry so all you need is readily available and easy to find. Touch-ups-Add extra party zest with fresh flowers spread around your home in fun, funky vases. Light scented candles to create a welcoming, warm feeling in your home. Don’t forget to set out your appetizers or finger food in beautiful dishes for your guests to enjoy. If all that sounds like a lot, we can help you with a pre-party clean. Contact our cleaning crew in Fort Collins, Colorado to have your home looking celebration-worthy. 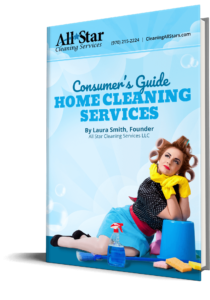 All Star Cleaning Services will make your house party central!